Imagine of a single change in your eCommerce website and see an immediate improvement in your conversion rate. …and each one of these strategy could generate more sale on your online store. These strategies are all based on our own research and results we have achieved in our agency. With these we have seen a conversion boost of up to 157% for certain clients. So lets start with the speed of your website. Do you ever wait on a website that is loading slow ? Same goes for your customers as well. 1 second of load time = 20% off of your conversion rate. Don’t take my words for it. Checkout these 12 case studies showing impact of page speed on conversion. …And google also loves faster loading website. So you are sure to get added advantage in form of improved search engine visibility. Test your website speed with Pingdom or GTmetrix or Google website speed testing tool. Work on all the possible improvements you or you developer can do. Apart from on site factors, website speed greatly depends on your hosting server. A dedicated cloud hosting server works perfect. One of the major difference in buying online is the absence of touch and feel experience of the product you are looking to buy. With high quality product images you can remove this barrier. In certain categories like apparels, shoes etc. its really important to have top quality zoomable images from various angles so customer can clearly see very last details of the product. A good image can lead to a purchase while a poor quality image can lead to abandonment. Read more about importance of presentation and context of product photos. What are the benefits of buying from your store ? is it free shipping, best pricing, express shipping, quality assurance ? Whatever it is. It should be clearly visible on key areas of your website. One of our customer was offering free shipping on orders over $50 but no where highlighted it. We added the relevant information on prominently on header, just below the add to cart button, just below the checkout button and guess what ? Conversion rate improved by 28.59% within a week. Finding the right product/information with bare minimum efforts is something we all love. Onsite search plays an important role helping customer finding the kind of product they are looking for. I have seen plenty of online store where onsite search produce really strange results. On a jewellery store while searching for rings, I could see the result page dominated with earrings. This can be really annoying from a customers perspective. Test your website search and make sure customers are not having this type of experience. 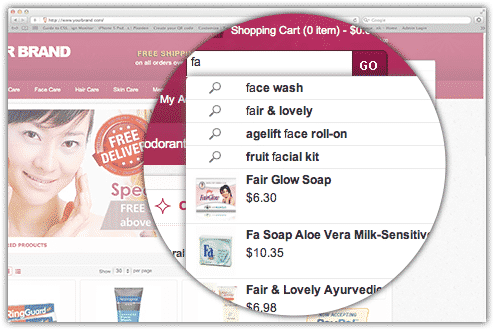 In platform like magento, you can monitor search terms used by customers on your store. Another great thing can do to improve customer experience is by adding an instant search suggestion as soon as customer starts typing something in the search box. Home page on any website receives a big percentage of visitors but can you show all your products on the home page ? In most cases the answer will be no. Anyone coming on the store might be interested to check some specific type of product based on their gender, age group, interest etc. Category navigation helps customers reaching directly to the type of product your customers are interested in. Even if you have a very limited number of products on the store, you should not ignore categorisation of products. Don’t you yourself check for reviews of product you are looking to buy ? As a human we are interested to know opinion of others about something we have thought of purchasing. Even in offline shopping we take opinion of our friends or known ones before buying a product or service. 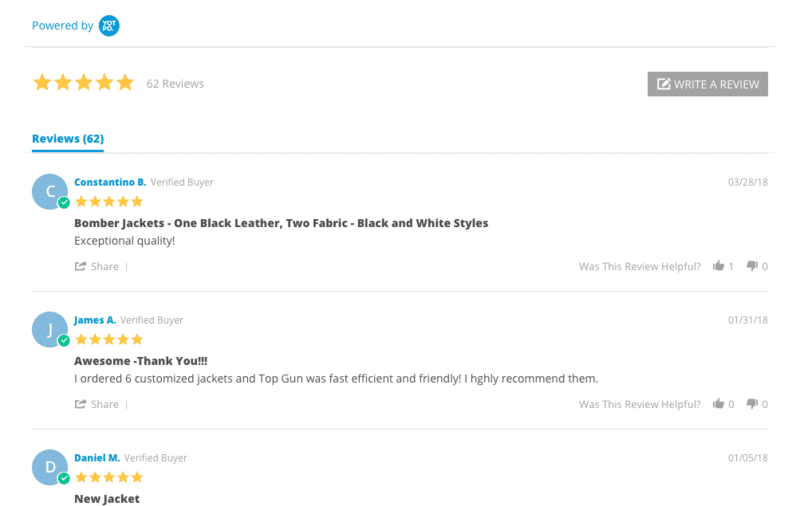 Reviews from previous buyers about a product on your store can be really helpful. Your customer can be your advocate online. A positive feedback can lead to purchase decision. So as a store owner you should start focusing on generating customer reviews from the very beginning. Encourage your customers to leave feedback. For our client, we many times run a special discount campaign just for leaving a feedback on past purchase. For our client we mostly use Yotpo, a tool that sends out an email automatically after certain days of order requesting a review from the customer. Imagine the impact of having 100s of store wide positive feedback couple of months later. Bonus Tip – You can use these reviews in form of rich snippets showing the star ratings in search engine results. This can give a good boost to click through rate to your website search impression. I am sure you get the point. This is one of the instant conversion rate booster. There can be lots of distractions and reasons of cart abandonment. Find and fixing any problem can be your another priority but what we are discussing here is an automated abandon cart email. Remind your customer about their cart abandonment via email. An email within one hour of customer leaving their cart can be most effective. Efforts of implementing this vary depending on the platform of your store. With all popular platforms like shopify, magento, wooCommerce, bigCommerce etc, you can easily find an app to do this. In our agency we use an email marketing tool called Klaviyo for abandon cart and many other email marketing automation. Pro Tip – Instead of single email reminder use a series of email. One email sent out after an hour, second email sent out after 24 hours and also offering a discount if complete the purchase within next 24 hours. Send a third email reminding them of the discount offer expiring soon. Even at best almost 95% of visitors will leave your site without buying something. Most of them will check your products and a good percentage of them can even put the items in their cart. With abandon cart email, you can only reach out to a fraction of them. Only one who have shared their email address with you. What are your options to re-connect rest of them ? Answer is Facebook Dynamic Product Ads. This is the great way of reaching out to customers who either viewed product(s) on your store or added product(s) to their cart. One Facebook Catalog – consisting of products on your store. A Facebook pixel installed on your site which tracks all the important events like view product, add to cart, initiate checkout etc. Once you have the above things in place, you are allowing Facebook to track action of visitors on your website. …And you are good to create a dynamic ad campaign. If done effectively, Facebook dynamic ads can be your money making machine. See below results from one of our client. If your current conversion rate is 2%, which means 98% of your store visitors are not purchasing from you. And as a store owner it should be our goal to try and develop ways to retarget to a maximum number of visitors. An email list can be a great way to promote your products. Yes, you get the point. Using popup boxes to build an email list. Hate it or love it but popup works. For some of our clients we have seen a signup conversion rate of 10%. That means you get additional 10% of your website visitors who can be your possible buyers in future. By signing up to your list they have already shown their interest. We generally use two types of popups. Offering a discount deal in exchange to signup can be a great lead magnet for eCommerce store. If you want to explore more ways of list building, Brian Dean from Backlico has shared some of the greatest strategies. Really ? Is it something not meant for bigger players ? Yes, this is how small to medium size store owner reacts when I suggest this. At maximum most of the store owner can think of abandon cart automation. But there are many more. For example a welcome series automation has been contributing over 10% in the monthly sale for many of our clients. If you are interested to explore more on this, I have shared a complete strategy for eCommerce email marketing automation. Have you ever closely noticed the checkout page on Amazon ? If you did, you just get the hint of what I am talking about. Amazon rules out distraction completely once a customer reaches on the checkout page. Players like amazon do every single thing based on a deep research. If they have done it surely means its beneficial. Following the same logic, we applied this to few of our clients. …And what we saw is an amazing 12.03 to 17.68% of boost in conversion rate. What if a customer has any doubt or question about a product, shipping or anything else ? Requesting help via a traditional contact form does not work for an eCommerce website. In a fast paced world every body loves the immediate help option. Live chat comes really handy in cases like this. If you support team is able to answer a customer’s query immediately, You have saved one customer abandonment. – Forrester found that 44% of customers think that having a live representative to talk to is the most important feature. – Econsultancy found that live chat has the highest rate of customer satisfaction, sitting at 73%. ..And why to ignore this when there are so good free options available and when it can be such helpful tool for eCommerce conversion optimisation. Try Zopim by Zendesk, Drift or many other free options available. When we hear the news of data theft every now and than, its really important to assure about safety and privacy of transaction on your store. First step towards this should be to implement a store wide SSL. Google Chrome has started showing alert to customers for non-ssl websites. Google itself loves website using SSL in their search result. Now you know how important this is. So go ahead and add HTTPS to all pages of your website. Second steps towards this is to conduct a security audit of your website. Specially when you are running a website on open source platform like Magento & wooCommerce. Once you have assured the security on the store, its time to let customer know about it. Put it on important action point like below the Proceed to Checkout button on cart page, below the final Place Order button on checkout page. Also keep it some where in footer. This will be a good confidence booster. And a confident customer will lead to improved conversion rate on your online store. The more details you share about your product the better your are educating customer about your product. A well informed customer will be a better candidate to buy your product. Product photos and video do a good job showcasing your product but still there can be untold story. While buying online customer cannot ask you questions they might have. Product description helps you answer all potential question a customer might have. Product description also gives you an opportunity to outline the values and benefits of your product. Don’t hesitate to writer longer product description. It helps you with SEO as well. Pro Tips: 1) Include long tail semantic keywords in your product description. 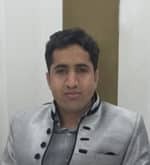 You will see great improvement in your search engine ranking. 2) This is based on my own experiment. Format your description in form of bullet points instead of longer paragraphs. I think no body can dare to ignore mobile user experience these days. Google has started rolling out mobile first indexing which means that google is starting to use mobile version of your page as a base for indexing and ranking. What google is trying to do is; improve their mobile user experience. What exactly you need to check & fix ? Checkout your mobile website for usability and performance. Speed is even more important for mobile devices. Check your online store in google’s official mobile friendly testing tool to find out usability issues. 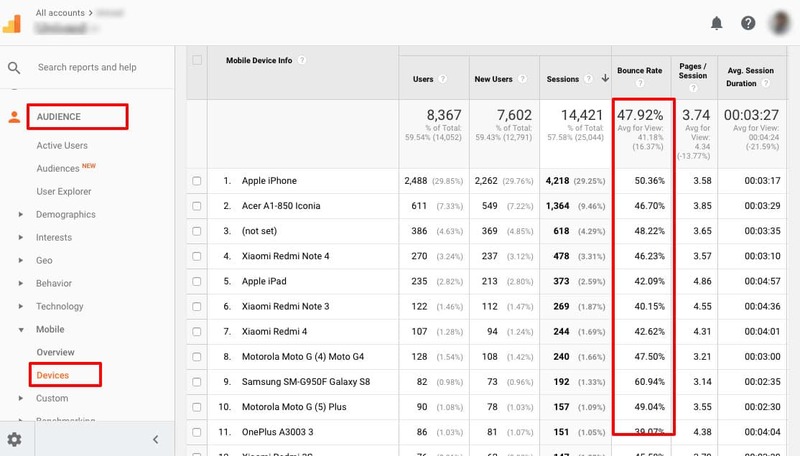 My personal favourite tool for finding issues with mobile website is Google Analytics. Checkout with data of past three months. Sort the result by Bounce Rate column. Higher bounce rate can be an indication of a possible problem in that particular device. Your next step would be to conduct a usability testing and fix any existing problem in these devices. Mobile website speed score is another important thing you need to check. Enter your website url and check the speed score in mobile section. Next step is to do a comprehensive speed analysis of your website using Google Analytics. Choose Browser in Primary Dimension and Device category in Secondary Dimension. Similar way you can check your desktop website as well. You can also use page timings to see any particular page being slow. Now you know the issues. Its time to fix all of them one by one. Add to Cart on product page, Proceed to checkout on cart page & Place Order on Checkout Page are the most important CTA on any eCommerce website. Using a clear colour contrast for these CTA button is really important. These buttons should not blend with rest of the colour scheme of the website. What if the product don’t fit or don’t fulfil my requirement ? Every customer has this question and this is a quite genuine question. As we know the absence of touch and feel experience in online shopping. A good return policy can play a key trust building role here. This does not mean you over promise. Important thing is that you give your customer an easy way to return products when valid reason are present. This is also a good business practice in general and many brick and mortar store also gives options to return a product. Don’t we all loves deals and discounts ? And from time to time every eCommerce store run various promotional offers & discount deals. So its always a good idea to have a special Sale section on your store. It will help customer to find the discount deals on a single page. Yes this was a response from a real customer on a survey conducted by a big eCommerce store. Read this interesting story of a “$300 million dollar button” and you will surely introduce a guest checkout option on your store. A Customer might have further questions even if you put detailed description and specification about a product. Introducing a Question & Answer section can be really useful. Slowly it will build a good bunch of questions/answer which will help your future buyers. Is it worth to call it an abandonment if you are trying to sell a swimming costume to resident of a desert land where water is so hard to get for daily life activities ? Your conversion rate will reflect real data only when you have relevant and interested visitors coming to your store. Quality of traffic is important, not quantity. Watch your traffic driving sources closely and figure out how they are coming on your eCommerce website. For example if you want to insure the quality of your search traffic, checkout the search term used by customers to reach out on your store. My personal favourite way to do this is using Google Webmaster Tool. This will show you complete list of google search queries sending traffic to your website. Evaluate the relevance of these queries with your products. This will help you understand and re-shape your organic search campaign. Similar way you can checkout your other campaigns. A slight improvement in the conversion rate can give a good boost to revenue of your online store. These actionable eCommerce conversion optimisation methods are based on our practical implementation with various clients. What is your experience with conversion optimisation ? Did you used or changed something on a store that improved the conversion rate ?